They are like children in a Dickens novel, but they live in contemporary Mainland China. Due to social prejudices, the children of convicted criminals are frequently shunned by their extended families and left at the mercy of the state. 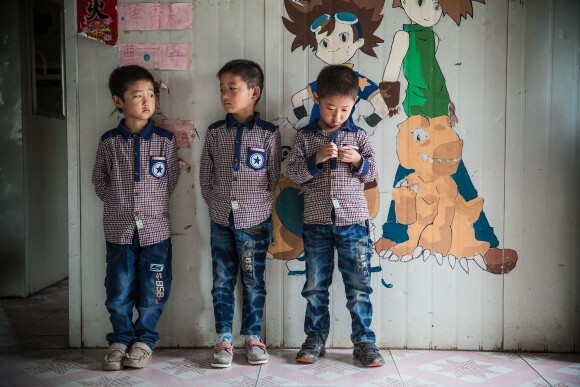 Thousands of these despised and dispossessed kids have found shelter in Sun Valley, a communal orphanage founded by Grandma Zheng, a former prison guard-turned social worker. We see life in Sun Valley through the eyes of several recently arrived and long-term residents in Kaspar Astrup Schröder’s “Waiting for the Sun,” which screens during the 2017 AFI Docs Film Festival. Evidently, the father of the Zhang Siblings (twin teen daughters and a younger son) really committed the murder he was convicted for. That is not always a given. There is no denying his remorse, at least with respect to his children. Since their mother deserted them at an early age, he has been the trio’s sole support. Sun Valley is pretty much their only option—and it will help that they will still have each other. This film is beyond Dickensian. The triplets are largely in the same boat, but they are even younger. In their case, it was their long-abused mother who finally killed their violent father—again, there are several other such “Burning Bed” cases represented in Sun Valley. Yet, the most heart-breaking case has to be 5 or 6-year-old Strawberrry, whom the police took into custody when they apprehended the human trafficker trying to sell her. This film is beyond Dickensian. None of these kids deserves their fate, yet they are bearing the brunt of their parents’ sins. Of course, their victimization compounds with their inevitable issues of guilt and abandonment. Granted, Grandma Zheng and her senior staff seem to be on the side of the angels, but we still witness a fair amount of bullying in Sun Valley, as well as some shocking abuse committed by junior employees. Frankly, “Waiting for the Sun” could be the most devastating critique of both Mainland social attitudes and the Communist government ever filmed. As far as the audience can see, the nation has virtually no safety net and precious little more compassion for its most vulnerable children. Any claims of solidarity and equity the legal and welfare systems might make wither in the face of Schröder’s vérité indictment. Wisely, he keeps himself completely out of the picture, opting instead to faithfully record reality for the Sun Valley residents unvarnished and unfiltered. The result is riveting, soul-crushing human drama. It is a film that will stagger you, but it also makes you feel keenly. Easily one of the most emotionally overwhelming documentaries of the year, “Waiting for the Sun” is very highly recommended when it screens Thursday, June 15 and Friday, June 16, as part of this year’s AFI Docs in DC/Silver Spring.